Just in time for Tax Day comes word that the nation's largest electric utility, Duke Energy, paid no federal income taxes on last year's profit of nearly $1.8 billion. Duke instead got a $46 million rebate in 2012, says N.C. Policy Watch, a project of the anti-poverty group N.C. Justice Center. Last week's blog post cites previous work on corporate taxation and off-shoring of profits by Citizens for Tax Justice and the Institute on Taxation and Economic Policy. Duke says it and other large companies are simply following the tax guidance in the federal government's 2008 economic stimulus package. Duke also accelerated $9 billion in spending to replace old power plants and upgrade other infrastructure, creating "tens of thousands" of temporary and permanent jobs, it says. Much of Duke's tax treatment relied on deferrals related to accelerated depreciation, Citizens for Tax Justice has reported. That's allowed Duke to take in $299 million in federal rebates despite profits of $9.1 billion between 2008 and 2012, for a negative tax rate of 3.3 percent, Policy Watch calculates. "If Duke wants to get serious about living up to its claims about what it is and what it stands for and begin to repair its tarnished image, it would do well to begin by paying its federal income taxes," Policy Watch writes, referring to state investigations of Duke's merger with Progress Energy. Duke will ultimately have to pay the deferred federal taxes, spokesman Tom Williams said. Duke also paid $402 million in property and other utility non-income taxes in North Carolina in 2012, the company said. Tougher federal air standards could further tilt U.S. electric power away from coal fuel and toward natural gas, says a Duke University study published online this week. Utilities including Duke Energy are fast moving toward gas as prices drop, retiring older coal-burning plants rather than fit them with new pollution controls. The cost of complying with stricter air regulations could make nearly two-thirds of the nation's coal-fired power plants as expensive to run as those fueled by natural gas, the study found. That would be true even if gas prices rise to four times coal's cost, it says. Duke Energy Carolinas' latest 20-year generation plan forecasts a 45 percent drop in coal use by 2032 and an 86 percent increase in natural gas. Duke Carolinas is retiring 38 coal-fired units in its territory. The Energy Information Administration released this graph Friday. 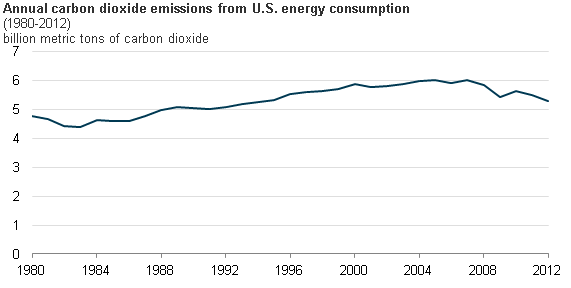 It shows that energy-related carbon dioxide emissions in 2012 were the lowest in the United States since 1994. The Duke study was published in the online edition of Environmental Science & Technology. The study is behind a pay wall, but here's the abstract. 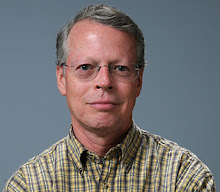 The lead author is Lincoln Pratson, a professor of earth and ocean sciences at Duke's Nicholas School of the Environment, with Drew Haerer and Dalia Patino-Echeverri.